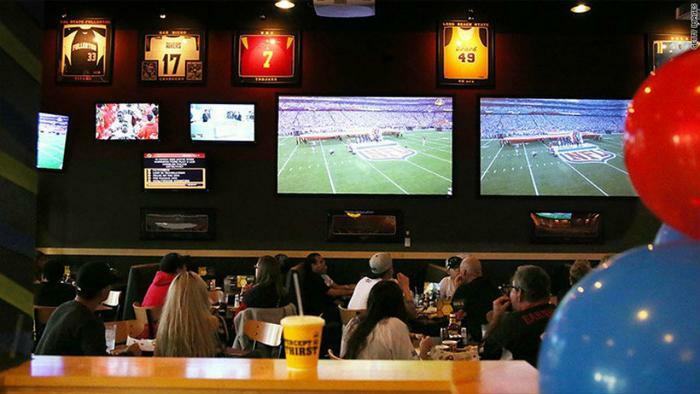 Sports bar chain Buffalo Wild Wings says it is exploring the possibility of offering legal sports betting at its restaurants. A patron could order a beer, a plate of nachos, and put $10 on the Patriots to cover the spread. A spokesperson for the company told ESPN the May Supreme Court ruling allowing states to legalize betting on sporting events has presented new opportunities to a restaurant where patrons often go to watch games on TV. "As the largest sports bar in America, we believe Buffalo Wild Wings is uniquely positioned to leverage sports gaming to enhance the restaurant experience for our guests," the company told ESPN. "We are actively exploring opportunities, including potential partners, as we evaluate the next steps for our brand." The 6-3 Supreme Court ruling overturned a 1992 federal law called the Professional and Amateur Sports Protection Act (PASPA). That law blocked states from sponsoring, operating, advertising, promoting, licensing, or authorizing sports gambling. The court held that Congress can regulate sports gambling activity if it chooses to, but if it doesn't, then each state is free to act on its own. New Jersey brought the case because the state wants to legalize sports gaming to help revive Atlantic City. It isn't clear how many other states will ultimately choose to legalize gambling, meaning Buffalo Wild Wings would only be able to offer gaming at its restaurants in states that allow it. According to ESPN, a logical way to deal with that issue would be for the restaurant chain to partner with a national gaming operator. Buffalo Wild Wings says it will study the possibility and won't comment further until it has reached some sort of conclusion, but ESPN hosts were ecstatic at the idea. "More power to them, jump on the train," said host Mike Golic, as he delivered the news. "You're either jumping on the train, or you're watching the train go by, or you're standing in front of the train." Gaming could also help spur sales at Buffalo Wild Wings, whose business has slumped in recent years as younger consumers have been less enthusiastic about the sports bar scene. The restaurant chain was acquired by Roark Capital, parent company of Arby’s, in February. According to gaming industry sources, as many as 32 states are considering laws to legalize and regulate sports betting within their borders.